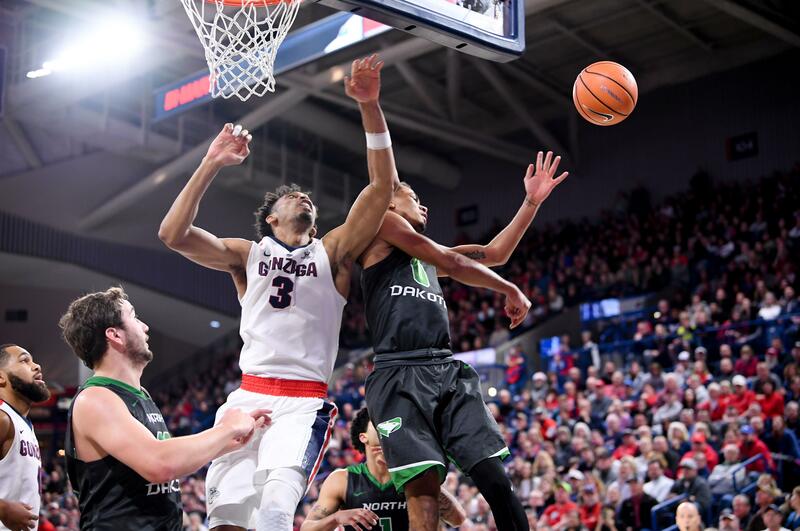 Gonzaga added an important piece to its men’s basketball roster next season with the addition of North Dakota graduate transfer Geno Crandall. Crandall, a 6-foot-4, 180-pound guard, announced his decision Thursday on Twitter. His three finalists were Gonzaga, Xavier and Minnesota. Crandall, a two-time All-Big Sky Conference second-team selection, should assume a major role with the Zags, who many consider national championship contenders but had been lacking proven backcourt depth. The 2019 Final Four is in Crandall’s hometown of Minneapolis. Crandall brings experience (90 career starts), playmaking ability (career averages of 14.3 points, 4.0 assists) and perimeter shooting (career 48 percent on field goals, 36.7 percent on 3-pointers). The Zags witnessed Crandall’s impact in a December meeting at the McCarthey Athletic Center. He scored 28 points as the 30-point underdog Fighting Hawks nearly pulled off the upset. Crandall drilled a 3-pointer in the final seconds of regulation, forcing overtime. Crandall’s arrival gives Few several options for lineup combinations. The Zags traditionally use three-guard starting lineups, and it wouldn’t be a surprise to see Josh Perkins, Zach Norvell Jr. and Crandall paired with two bigs. Gonzaga could go bigger, with Killian Tillie, Rui Hachimura and Brandon Clarke joined by two guards. Crandall figures to see plenty of minutes, whether he starts or comes off the bench. Norvell started 29 games last season. Sophomore wing Corey Kispert started the first seven games before suffering an ankle injury. Perkins is recovering from April shoulder surgery but anticipates being ready for his senior season. Prior to Crandall’s commitment, Gonzaga’s backup point guard options were incoming freshman Greg Foster Jr., redshirt freshman Joel Ayayi and possibly some limited minutes from Norvell. Crandall signed a financial aid agreement, according to Gonzaga. He’s finishing up a couple of classes to complete his degree and become immediately eligible, and expects to be in Spokane in early August. Crandall averaged 16.6 points, 4.3 rebounds and 3.6 assists last season. He scored 41 points against Troy in the season opener and led the Big Sky with 67 steals. He hit a career-high 41.7 percent of his 3-pointers. Crandall ranks fourth in UND history in steals, seventh in assists and 14th in scoring. He led the Fighting Hawks to the school’s first NCAA Tournament appearance two years ago. The Zags have been in the mix for several guards, including highly rated prep standout Brandon Williams and Albany grad transfer Joe Cremo. Williams committed to Arizona and Cremo picked defending national champion Villanova. Published: July 5, 2018, 10:14 a.m. Updated: July 5, 2018, 7:05 p.m.